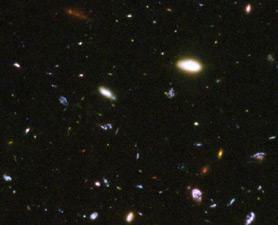 Oldest Object in Universe Found! A research paper that appeared last week in the Nature said that astronomers were able to fish out a galaxy whose light has traveled more than 13 billion light years to reach us. This officially made it the oldest astronomical object ever found. The galaxy, being called UDFy-38135539 is suspected to be the oldest object discovered so far. However many astronomers said that the title for UDFy-38135539 will be short lived. One lead researcher Matthew Lehnert said, “I don’t think this is the limit, perhaps not even that close to it”. Measurements indicated that the UDFy-38135539 formed within 600 million years of the universe’s creation. Finding UDFy-38135539 was no easy task. Lehnert said that with diminishing faint light it will be nearly impossible to find more with time. He said, “UDFy-38135539 was already a challenge and perhaps we won’t be able to do much better than it for a while yet”. It took almost four years for astronomers to confirm UDFy-38135539 at a redshift of 8.6. Redshift refers to what happens when light seen coming from an object is proportionally shifted to appear more red. These oldest galaxies are of particular interest to astronomers and scientists which they claim holds clues to our future.